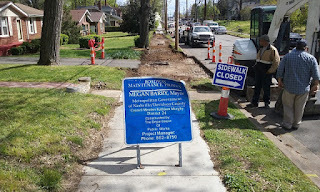 A Disgruntled Republican in Nashville: What's on the April 3rd Council agenda: Requiring an annual sidewalk construction study, more $ out of reserve funds, $625,000 for production of "Nashville." What's on the April 3rd Council agenda: Requiring an annual sidewalk construction study, more $ out of reserve funds, $625,000 for production of "Nashville." By Rod Williams - The Metro Council will meet Tuesday, April 3, 2018 at 6:30 PM in the Council chamber at the Metro Courthouse. If you are going to watch the Council meeting, you need a copy of the Council agenda and the staff analysis or you really will not know what is going on. You can get the agenda and analysis at the highlighted links. The first order of business is the call to order, prayer and pledge followed by consideration of mayoral appointments to boards and commissions. There are seven mayoral appointments to boards and commissions on this agenda for Council confirmations. The council normally rubber stamps whomever the mayor nominates. Bill BL2017-1029 by Councilman Steve Glover would change the laws regarding "contributions" paid in lieu of the construction of sidewalks. If a developer develops a piece of property they are supposed to build a public sidewalk in front of the property. Sometimes when that would be the only sidewalk on a street, it makes no sense to build a segment of unconnected sidewalk to nowhere and the developer may instead of building the sidewalk pay a fee into a fund which is used to build sidewalks. It is called a "contribution" but of course it is not really a contribution but an option of build the sidewalk or paying a fee. This bill says that, that "contribution" would be for construction of sidewalks within the Council district, where the property is located rather than the "pedestrian benefit zone," in which the project is located. I don't have strong feeling one way or the other on this. Council district boundaries change every ten years. Also, I am unfamiliar with the boundaries of pedestrian benefit zones. Bill BL2018-1122 would reinstate a requirement that the specific location of waste transfer facilities to be approved by resolution of the Council prior to the public hearing conducted by the Metro Board of Zoning Appeals (BZA) to consider such special exception requests. That is the way it was prior to August 2017. Unless there is a good argument for not reinstating this, then I think it should be reinstated. Waste transfer stations are often unwelcome in a community and my gut feeling is that this should be a decision in which the public should be allowed to have a voice. sidewalk costs. The study would solicit input from all affected parties and include a public hearings. This is a good bill. I have observed almost perfectly good sidewalks ripped up and replaced yet streets that need sidewalks don't get them. It should be criminal how much money Metro waste on sidewalks to get such few sidewalks. Back in October, The Tennessean investigated Metro's sidewalk program and found that city allocated $30 million a year for each of the last two years for sidewalks and the city build only 3.5 miles of new sidewalks. I suspect million of dollars goes to consultants. If I ran a news agency, I would follow up the initial Tennessean story and find out who got the money and what was their connection to city officials and political campaigns. Maybe knowing a report has to be made to Council every year, their will less blatant waste in the sidewalk program. There are 18 resolution on the agenda and all are on the consent agenda at this time. A resolution stays on the consent agenda if it passes unanimously the committees to which it was assigned. Resolutions which receive negative votes in committee are pulled off of consent. Also any councilman may have a resolution pulled off of consent. Those remaining on consent are lumped together and passed by a single vote. Resolutions on the consent agenda are usually not controversial and tend to be routine matters, such as accepting grants from the Federal or State Government, entering into inter agency agreements over mundane things, appropriating money from the 4% fund, settling lawsuits, or approving signs overhanging the sidewalk. Unlike a bill which requires three votes of the Council to pass, a resolution only requires one vote of the Council. Resolution RS2018-1123 appropriates $19.759 million from the 4% fund to various departments. This is normal and is for purchasing of things that ware out or for unexpected repairs. $1.5 million is for library material, $1.5 is for maintenance material and supplies for the parks department and .5 million for Metro General Hospital. Due to our fund balance falling below an acceptable level, I would think it wise to defer some of these expenses, such as purchasing new books for the library, until the new fiscal year. Resolution RS2018-1124 is a supplemental appropriation of $2,516,400, largest amount going to the Sheriff's Department for salaries. This supplemental appropriation reduces to 3.18% for the GSD General Fund and 3.93% for the USD General Fund. According to a policy approved by the Council in 1989 and by Office of Management and Budget in 2005, the minimum fund balance percentage should be no lower than 5% of the total operating budget. This is an indication of Metro's mismanagement. agreements from money already appropriated for that purpose. The grants are $50,000- Musicians Hall of Fame and Museum (Rolling Stones exhibit), $325,000- The Country Music Film Project (Ken Burns documentary), and $625,000- Music City Productions ("Nashville"). While I am a big fan of music and especially country music and love Nashville's identity as "music city," I question if this is a wise use of limited resources especially considering the needs of our schools and the shrinking reserve fund balances which could endanger our bond rating. Since the money is already appropriated however, it may not be wise to impound the money at this point, but this may be the type of thing the council should carefully consider before doing it again. Bills on First reading: There are 16 bills on first reading. First reading is a formality that gets bills on the agenda and they are not considered by committee until after they pass first reading. They are all lumped together and pass by a single vote except in rare circumstances. I do not read them until they get to second reading. Bill BL2018-1111 would put under the purview of the Board of Ethical Conduct and the Standards of Conduct those who violate executive orders regarding rules of conduct. Currently this board only has authority to act on those who violate a section of the Metro code concerning standards of conduct. Concern is expressed that this would put too heavy of a burden on employees to defend themselves against complaints filed with the board. At last council meeting it was discussed and then deferred one meeting. To understand the arguments on both sides of this issue you may want to watch the video of the March 20th meeting at timestamp 1:29:18-1:51:15. Bill BL2018-1140 will create a South Nashville Central Business Improvement District. A district such as this creates a governing body which may impose additional taxes on businesses within the district for project within the district. Such project may include building parking facilities, promoting the district, beautification and improvement projects in the district and more. The initial additional tax levy will be 55 cents per $100 of assessed value of real property and estimated initial projects will cost approximately $10.948 million. This district would consist of approximately 266 acres, whose boundaries are approximately Cane Ridge Road to the West, I-24 to the East, Target Drive to the North, and Old Franklin Road to the South. There are other such districts like this, including the central business district.